As with any other new signing, there has been high demand for footage of Sebastien Squillaci in action. But most compilations you might have found are of him scoring goals or his performances from more than five years ago. And for a good sneak-peek of the player Arsenal have signed, that would not be the best video to use. As a defender, Squillaci’s blocking, heading and tackling, along with his most recent displays as a Sevilla player (and not at Monaco ages ago) are what you would want to see more of. So to greet his arrival yesterday, here is a better compilation of Sebastien Squillaci defending. I actually turn off my speaker for videos like this where I have to focus and analyze the player (and not the music). The music keeps your attention off any good or bad moves the player did. So I turn it off! You think that torture of a soundtrack is good, you think that well-compiled video is “OK”. Hmmm…let me guess, you probably think Henry was ‘overrated’, don’t you? u welcome to turn the video music off and listen to your favourite Cher or Enya tracks… ok iv watched the video again and will correct it to a well made video, happy? but still think he isnt the player to solve our defensive problems and isnt great. hmmm… let me guess, you probably think cygan was ‘underrated’ don’t you? I THINK HE IS STILL NOT THE MAN THAT WE NEEDED. Arsenal fans are never satisfied, just because Toto is not a household name that means he’s not the man we need? Arsenal fans are never satisfied, just because Toto is not a household name that means he’s not the man we need? He! Oh my goodness. Is this what it has become for you ever-wishing and never satisfied fans now? Buy whoever you play against? 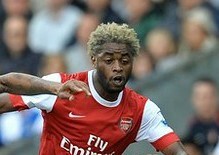 When did Samba have a ‘technical’ ability which Arsenal lacked? And when did Liverpool flop Diouf become a hit? What’s next? Let’s get Allardyce to replace Wenger? Sorry, but this video shows nothing. Most defenders would have a complilation like this. Nothing special about this guy whatsoever. Arsenal really need a top class Keeper – without that, they will win nothing this year. Or next, etc. i dont know hey, samba would be a decent addition, hes quick, damn tall and his defending isnt bad, got prem experience too. diouf tho…lolol. no chance in hell that guy is coming to arsenal. All Kudos to sagna & walcot they play perfectly well. Alumina played well yesterday but arsenal need to buy schwarzer fast b/4 d transfer window close. he looks hard-working, determined, fearless and someone who will never give up… good luck to him! Guys, let us give this bloke a chance. But for his age, i would have thought we are about to see a new Patrick Viera. this is very annoyingly edited and tells me nothing. still, i have high hopes. No video could ever tell you how good a player will be in your side… if we supported Man Utd and signed Veron his youtube highlights would have given us a hard on… what happened? he was a very expensive flop… haha. Last year our very common cynical fans made the same statement about TV and now we consider him our best defender and an amazing buy… doesnt Squillaci deserve a chance? I am simply neutral to Squillaci signing…if he starts a game soon I wont be anxious or nervous I will just hope and think he will do what is required, nothing fancy, just defend well. hes gunna en plike cygan or sendros snm. What a pity that we have a manager who relies on the outdated scouting system to identify new signings when he should sitting at his desk watching YouTube.